Divorced, co-parenting, middleaged, working to get by, children leaving the nest to go to college, and not really looking for a relationship. 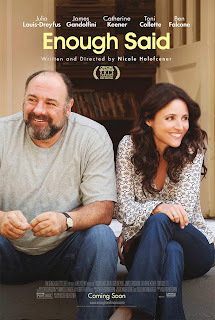 James Gandolfini and Julia Louis-Dreyfus make for a subdued pairing of two nondescript people who find comfort in one another's company: just another couple of any number of ordinary people. But blossom it does this unlikely romance and two everyday run of the mill lives are so much more together than they are apart. This isn't anything high and mighty like Romeo and Juliet; this is more the cosiness of a pair of old slippers: wonderful to wear but not necessarily so beautiful to look at. Then again, isn't the ordinary what's so truly comfortable in real life? Eve (Julia Louis-Dreyfus) is a divorced single mother who works as a masseuse comically lugging her massage table from client to client. At a party, she meets both Albert (James Gandolfini), a divorced single father, and Marianne, a divorced single mother. Eve dates the sweet funny Albert and takes on as a client Marianne, the beautiful poet. We watch the romance blossom with Albert as the client relationships turns into friendship with Marianne. But, Marianne continually makes disparaging references to her ex. At some point, the clues comes together and Eve realises Marianne is Albert's Ex and the nonstop criticisms of Albert begin to affect Eve's perspective on Albert. What was unimportant becomes worthy of criticism. What was cute becomes questionable. Of course, Albert eventually finds out what is going on and breaks off with Eve, the sad moment in any love story. This is one of James Gandolfini's last roles before his death in June 2013. It is interesting to see him as the antithesis of his famous Tony Soprano. Here he gives a charming performance as the big lovable teddy bear. This isn't love at first sight for Eve; this is more of a slow warm-up to an easy going relationship. The film was written and directed by Nicole Holofcener, an impressive double duty. A perusal of the Wikipedia article on this person shows a woman who is both talented and busy in her career as a writer and a director. This is quite the developing CV. Stand by, I'm guessing there's more to come. I enjoyed the film. On the one hand, the story gives hope to anyone who is middleaged and divorced. On the other, the story sort of shows a sad take on anyone who is middleaged and divorced. Being alone may be better than being lonely in a relationship. It's certainly better than fighting. But with all affairs of the heart, hope springs eternal and for anybody slogging through life after their midlife divorce, this may give the idea that there is still a chance to find somebody with whom one can find some sort of mutually satisfying relationship. However it doesn't mean to say that relationship won't be without its trials and tribulations. As Dean Martin sings at the end of the trailer, "Ain't love like a kick in the head?" Wryly charming, impeccably acted, and ultimately quite bittersweet, Enough Said is a grown-up movie in the best possible way. Enough Said is a 2013 American comedy film directed and written by Nicole Holofcener. The film stars Julia Louis-Dreyfus, James Gandolfini (in one of his final film roles), Toni Collette, Catherine Keener, Ben Falcone, and Toby Huss. The film was released on September 18, 2013.